The NOAA Ocean Surface Bundle (OSB) Climate Data Record (CDR) consist of three parts: sea surface temperature; near-surface wind speed, air temperature, and specific humidity; sensible and latent heat fluxes. This portion of the OSB CDR is the NOAA Climate Data Record (CDR) of Ocean Near Surface Atmospheric Properties. Evaluation the near-surface atmospheric temperature, humidity, and wind in comparison to similar values at the sea surface describe essential aspects of the air-sea exchange. The Special Sensor Microwave/Imager (SSM/I), a passive microwave sensor, along with the sea surface temperature CDR provide this data after application of a combination of statistical techniques using neural networks and diurnal warming parameterizations. From these data, the near-surface fluxes of evaporation/latent heat and sensible heat calculations provide the CDR final record on a 3-hourly 0.25 degree resolution grid over the global ice-free oceans. Cite as: Clayson, Carol Anne; Brown, Jeremiah; and NOAA CDR Program (2016). NOAA Climate Data Record Ocean Surface Bundle (OSB) Climate Data Record (CDR) of Ocean Near Surface Atmospheric Properties, Version 2. [indicate subset used]. NOAA National Center for Environmental Information. doi:doi:10.7289/V55T3HH0 [access date]. Direct download for the CDR data files. THREDDS Data Service for this dataset. Current dataset landing page with general information and links to access the data. Access to the published CDR product, documentation and source code. Previous dataset landing page with general information and links to access the data. Gives a full overview of the project, including error estimation of the retrievals. This source code is for reference only. The source code is provided to maintain transparency of the algorithm and processes used in creating the Climate Data Record (CDR). The source code is not intended to be portable to any computer system(s) beyond that of the original CDR producer's environment. The Data Flow Diagram for Ocean Surface Bundle (OSB) CDR shows an overview of the steps used to produce the dataset. Algorithm Theoretical Basis Document for the CDR product. A science paper about a high-resolution satellite-based dataset of surface turbulent fluxes over the global oceans to complement the existing products for surface radiation fluxes and precipitation. Science paper on Coupled Ocean Atmosphere Response to Seasonal Modulation of Ocean Color: Impact on Interannual Climate Simulations in the Tropical Pacific. Science paper on Predicting near-surface atmospheric variables from Special Sensor Microwave/Imager using neural networks with a first-guess approach. 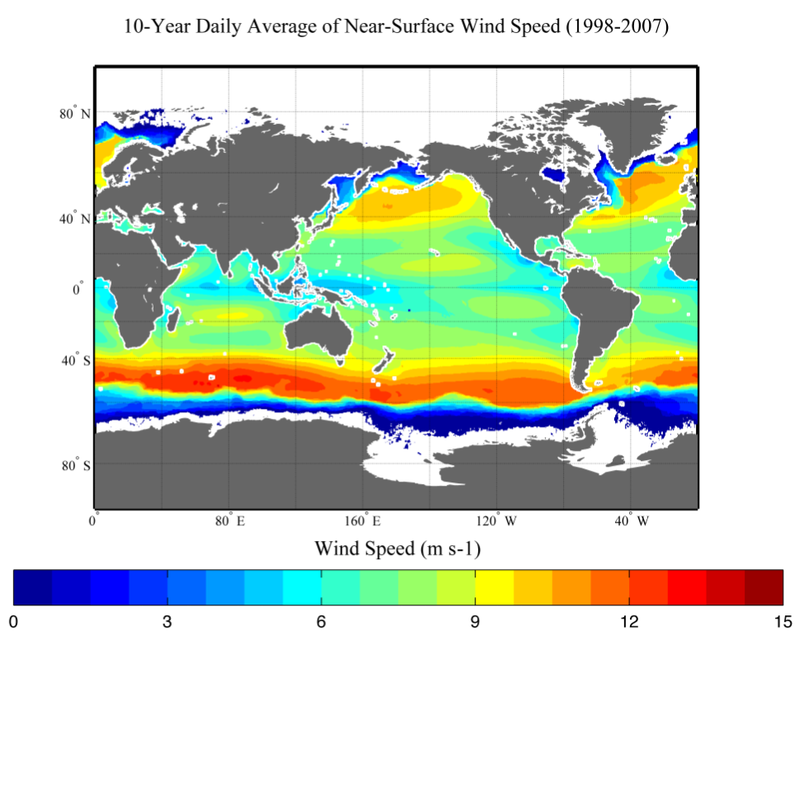 Purpose This dataset provides a high quality Climate Data Record (CDR) of ocean near-surface properties that can be used for any analysis of the latent and sensible heat fluxes and the associated surface parameters from synoptic scale through climate variability. Estimations of the humidity and temperature gradients may be underestimated in very extreme conditions. Flux calculations may also be in error during very high winds due to errors in the bulk flux model. For a complete description of use limitations for this CDR, see Section 6, Assumptions and Limitations, in the respective Algorithm Theoretical Basis Document. Flags indicate whether the values are the retrieved value or an interpolated value. Lineage Statement The data was produced by Woods Hole Oceanographic Institution and are archived at the NOAA National Center for Environmental Information (NCEI). For more information, see associated processing documentation. For a complete description of the processing steps, see the Algorithm Theoretical Basis Document and Data Flow Diagram. NCEI Archive Information Request System (AIRS), where the data can be delivered by Satellite ID, Data Type, and for a given time period. NASA Website for SRB Data.